When I scroll through my Twitter, Facebook or Instagram feeds, I always see people post messages of self doubt and being negative towards themselves. I'm a massive victim of this, because I know writing down what's bothering you always helps, but sometimes we all need that bit of support when we're feeling inferior or down, so posting it for the world to see is what we do. 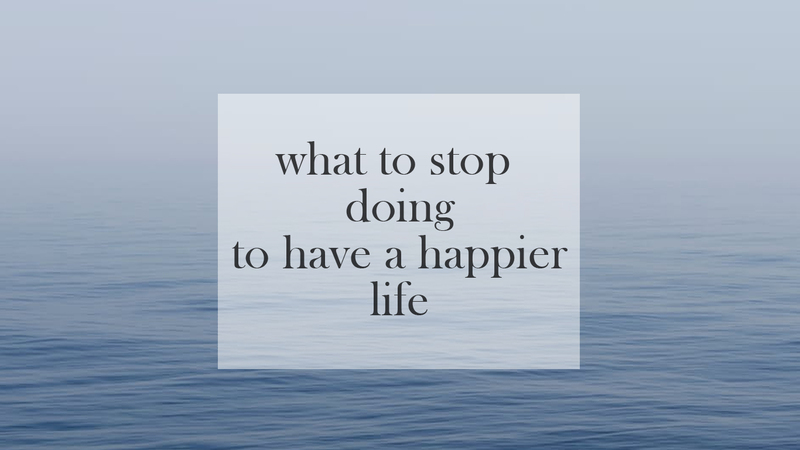 For today's post, I want to talk about what we as people should stop doing in order to have a happier life. Note: These are just things that I have thought of off the top of my head and may not work for everyone else. Please also note that I am not a qualified professional doctor, psychiatrist or counsellor. Stop the comparisons - By this, I mean stop comparing your work, style, looks, efforts and self to something or someone else. We are our own people with our own individual talents and we are not the same as the person sitting opposite us in the pub, lecture hall, classroom, park, restaurant... We are our own individual person. By not comparing ourselves or our efforts to other things, it'll show that there is something worth it in what we do and who we are. Life is not a competition! Praise yourself more - I was told by my counsellor to do this, and it has proven to be beneficial. Don't think that because someone may not seem interested, that you cannot vocally express how proud you are for doing something. If you got over anxiety to do something new for the first time, that's amazing. If you've gone a few days without having a 'bad' mental health day, congratulations! Every human being has different degrees of what we class as 'a big deal' and what is not, but never stop being proud of everything you do - no matter how big or small. Appreciate the little things in life - As people, we always seem to let the little things which happen and cause positivity for small amout of time slip away from us. It's hard to not do this, but it's manageable. Take time in your day and think to yourself 'What's been good today?'. Whether it be about the weather, you having a good hair or makeup day, chatting to a old friend for a few minutes, you've had a good day at work - appreciate it. Breathe - Whenever things get stressful, anxiety raising, tense, breathing can help. It sounds silly, but it does work. Taking time to step away from what's happening to make you feel this way and just breathe, focus your mind on something nice and just focus on that. If you're focusing on what book you're going to read tonight, what you're going to have for dinner or having a nice bath or shower to relax yourself later on, just do it! Regret less, live more - As my mum always says, life is too short for regrets. Sure, we all make mistakes and do things we may particularly wished we hadn't, we as people must reflect on these. Life is all about the learning curves it throws us and thus, helping us develop as human beings. Don't dwell on the regrets and just live. Live for the moment - This is particularly a favourite quote of mine, because I always think of it whenever I catch myself consciously over thinking of things and causing myself anxiety. Live for now, and not for next week, tomorrow, next month. Live for each second that passes you by, because one day, it'll all have gone too fast and you'll blink and wonder where the time has gone. Don't sweat the small stuff - Overthinking is your worst enemy. By doing this, you're going to put yourself under stress and that isn't good at all. Worrying about little things isn't worth it, especially when it will make your day-to-day running of life more worrisome and negative. Worry about the big things that matter, not about the fact your shoes got a bit wet in the rain or you've misplaced something. What are some things that you've stopped doing and are happier for? Let me know! Thanks so much lovely! Totally agree with you though, I think sometimes we all need a bit of a reminder when things get a bit hectic. Very important things to keep in mind, especially when things start to become overwhelming. One step at a time, and never give up. Thanks for sharing, Chloe! Exactly! I'm glad you liked this post, lovely. It means a lot! That's what I thought, plus I can look back at them if I need a little pick-me-up for how far I've come! Exactly! Living with comparing yourself to others really isn't a way to live at all!